2. MISSION "PALMER": Three rounds, one minute of each exercise per round: double-unders, wall ball, sumo deadlift high pull, push press, and box jump. (1) Intent. Complete the exercises, as quickly as possible, in a safe manner. This is a five-person-team, "task-specific" workout. 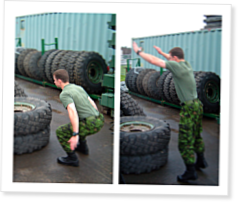 The purpose of this workout is to develop cohesion and combat fitness under fatigue conditions through shared hardship, challenges, and competition. (2) Scheme of Maneuver. The platoon will be divided into as many teams of five as possible. Each team will require a skipping rope or sash cord for double-unders, a 20-lb medicine ball or austere medicine ball for wall ball, a .50-cal ammo can for sumo deadlift high pulls, a 25-mm ammo can for push presses, and two Stryker tires for box jumps.